Digital Farmers Reaping Big Harvests in Kenya « Adafruit Industries – Makers, hackers, artists, designers and engineers! There is something of a digital agricultural revolution taking place in Kenya: unemployed workers are turning towards farming as a means of income-and their success is largely due to the incorporation of drones, tablets, and farming apps. 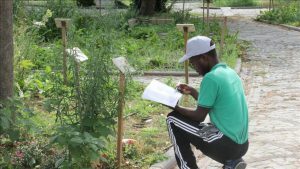 Samuel Maina is among the many youths in Kenya who have gone into digital farming, which uses technology such as drones or phones, tablets with apps to monitor the farm, be it identifying weeds, the type of sickness that is plaguing plants and animals (using the camera on the phone), feeding patterns, etc. Maina is involved in hydroponic farming (growing plants in water, not soil). He says his crops – tomatoes, vegetables, spinach, peas and others – use 90 percent less water, compared to those of a traditional farmer. He is also able to grow four times the amount of crops in the same space as traditional soil farming, he says. Armed with his Ipad, Maina opens an application made for farmers, which scans the plants to identify potential weeds; he is delighted to find out that, for now, his farm is weed-free. “The older generations refer to us as dotcom farmers because we use technology,” Maina added. He closes the application and opens another one which has an electronic map of his farm,” As you can see here I have a complete database of all the plants in my farm, from my device I can easily monitor all the activities on my farm,” Maina explained.